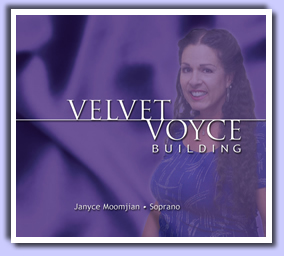 Below are the recordings released by Janyce Moomjian. Take a listen to her recordings by clicking on any song title, and pick one up today. This fantastic instructional CD helps students develop the basics of good vocal health. Emphasis is on the removal of tension from the lips, jaw, tongue and soft pallette. The course also develops the student's ear for pitch and vocal strength and range. 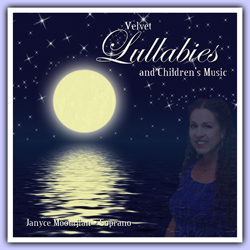 Janyce is also offering Velvet Voyce's children's music and lullabies. These songs have proven to be popular at the Elementary Schools of Central California and they are perfect for play time, rest and sleep time. All 8 of these songs are Janyce's original compositions. She dedicates this CD to all the children everywhere. Janyce has been performing her Christian music through out Central California and she has compiled her work in her Music For The Lord CD. 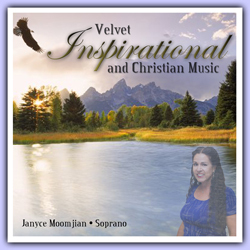 These special songs are inspirational and uplifting and they give comfort and hope to everyone. For a limited time, Velvet Voyce Enterprises is offering a special pricing on all 3 CDs, when they are purchased together. 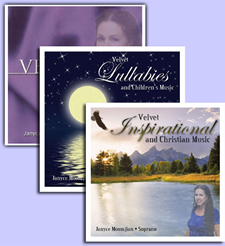 This price includes the Voice Building CD, the Lullaby CD, and the Inspirational Music CD. Buy all 3 CDs at the special discount price of $44.99.